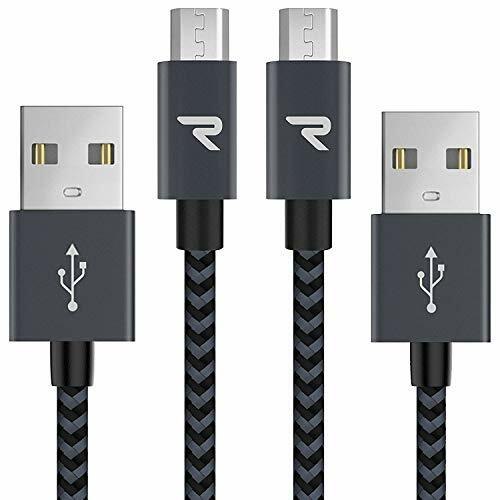 FAST CHARGE & SYNC - RAMPOW Micro-USB charging cable is enhanced with 21 AWG power wires, ensuring safe, high-speed charging up to 2.4 A, and works better for tablets and quick charge devices. EXTRA DURABILITY - Forged from premium quality nylon braided textile and further reinforced by shield added metal connector tips. This USB Micro charging cable can withstand even the most demanding heavy duty routines. UNIVERSAL COMPATIBILITY - These Samsung charger cords support most Android tablets, Windows phones and cell phones with a Micro-USB port. Compatible with Samsung Note 1/2/4/5, Galaxy S3/S4/S6/S7/S7 Edge, Nokia Lumia, LG, Kindle, PS4 controller and more. 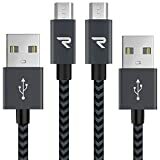 TANGLE-FREE - These highly portable 2- pack Micro-USB charging cables (1m / 3.3ft) are ideal for everyday connection needs. RAMPOW LIFETIME WARRANTY - Please contact us with any question or concern - we are here to help.